A nurse cleaning and taking care of a sick child in isolation at Hospital St. Louis, Paris (© Owen Franken). At the "Science Comes Alive" event at the 2008 Cambridge Science Festival, MIT Club of Boston member John Dolhun PhD '72 led a group of club volunteers in presenting educational experiments and demonstrations for kids. We all know it’s good to give back and volunteer in our communities. Here’s a fun way to do just that. The Cambridge Science Festival, a nine-day celebration of science and technology that encourages audience participation and discovery, is currently seeking proposals of lectures, performances, family activities, exhibits, tours, debates, workshops, and any other creative activity for the fourth annual event, held April 24-May 2, 2010. The citywide science extravaganza, the first of its kind in the U.S., showcases Cambridge as a leader in science, technology, engineering, and math (STEM) by making science accessible, interactive, and fun. Think movie or art festival, but for STEM. Past presenters have offered hands-on origami demonstrations, taught the basics of solar cookery, explored sound through numerous musical instruments, run a mystery game using handheld GPS devices, and helped kids build and launch water-bottle rockets. Festival participants are selected through a curated process, and proposals are judged based on audience appeal, technical feasibility, site availability, and funding. Applicants are encouraged to involve community-based organizations in the planning and production of programs. Proposal deadline is December 12, 2009. Learn more about the festival and submit proposals. Living Meritocracy at MIT: That’s Diversity! See video profiles on the diversity Web site. Compare MIT’s entering class in 1868 and 2009. The 19th century class was all male, Caucasian, and U.S. born. The 21st century class was 55 percent male, 36 percent Causasian, and 8 percent international. 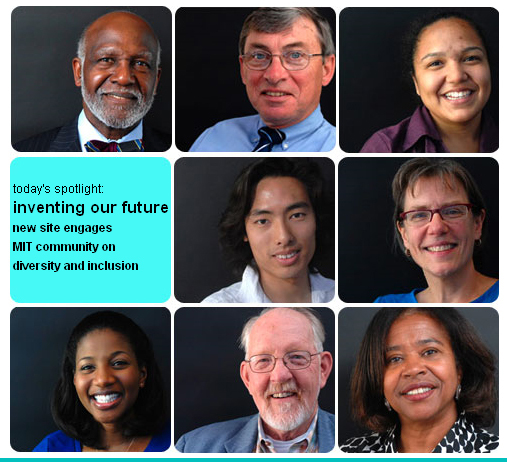 Those snapshots, offered on a new diversity Web site called Inventing Our Future, illustrate MIT’s commitment to the core value of meritocracy. Inventing Our Future is a repository of valuable data ranging from reports on diversity, gender equity, and faculty composition to diversity statistics of students, faculty, and staff and a growing blog. The MIT spinoff robotics company, Boston Dynamics, recently released footage of their PETMAN prototype, a biped robot the balances dynamically using a human-like walking motion. The company says it is a close relative of BigDog, sharing elements of the mechanical design and control. However unlike BigDog, PETMAN will be used to test chemical protection clothing by the US Army. The biped will simulate human physiology within its suit by changing temperature, humidity, and even sweating when necessary. After a 13 month design phase, the program has a 17 month build, installation, and validation phase. Delivery is scheduled for 2011. Last Sunday Melissa Williams ’06 was lounging in her California apartment when her mother burst in with plans for a walk, an ab workout, and a leg workout. No, Williams’ mother is not a fitness instructor. She’s just excited about training for a longer walk that her daughter has planned, one that will raise money to support diabetes awareness and prevention—and last about six months. From January through June 2010, Williams (joined frequently by her mother) will be walking from San Diego up along the coast to San Francisco, and then heading east through wine country to Sacramento. Slice: Why did you start the California Wellness Walk? What motivated you to get involved with diabetes awareness and prevention? MW: The walk started as an interesting idea last fall. I work as a healthcare consultant helping pharmaceutical companies make better investments. In one project, I worked with a talented team to model diabetes, and the results of the model scared me into action. Diabetes is unique—prevalence is skyrocketing, but at the same time, healthy lifestyle choices significantly reduce your risk of diabetes. With a lifetime of obesity and a family of diabetics, I was well on my way to becoming a diabetic myself, but healthy habits and weight loss could change that future. I realized that I needed to change, and in the process of getting healthy, I wanted to help inspire others. From there, the Walk was born. Growing up I was the fat kid who couldn’t run a mile to save her life. Now at 24, I’m walking from San Diego to Sacramento showing by example that you can make a positive change in yourself. Slice: What is MIT’s role? MW: MIT has been a large part of the success of this project. While a Biology undergrad, I volunteered with Keys to Empowering Youth. KEYs brings together 11-13 year old girls in workshops with college girls to encourage interest in science and engineering. It was an amazing experience mentoring these girls month after month and watching their excitement and interest grow, and that experience formed the foundation of the classroom workshops with the Walk. Just as we were encouraging interest in science and engineering in KEYs, I would like to encourage healthy habits through the Walk workshops. While at MIT, I also worked at the Public Service Center, and when I came up with the idea for the Walk, I contacted Sally Susnowitz to get her opinion. Since then, Sally has been a wonderful mentor and coach, and the walk would not be where it is without her. Add in my friends from MIT who have all pitched into the planning, and MIT has been instrumental in the Walk. Slice: Whom will you be walking with? MW: I will walk the full 750 miles and be joined at different stages by fellow walkers. My mother is walking for the majority of the Walk, Cate Smith ’06 is walking in April after receiving her MD, and others are pitching in for other weeks and long-weekends. It’s a diverse group and we’re all committed to improving our health and the health of others. Slice: How have people responded to your project? Slice: MIT alumni will be hosting you along the way. How did you find the alumni hosts? MW: We’ve worked closely with the listings on the Alumni Association’s Infinite Connection. There are over 5000 alumni along the route! We’re currently conducting our first wave of outreach and are optimistic from our early responses. Learn more about the walk on Melissa’s blog, or follow her Twitter feed. Donations are accepted through her CA Wellness Walk Web site. Although commentators are talking about green sprouts poking up through the somber economic landscape, it’s still tough to garner success in business. Still, you can find some optimism and tips from MIT sources. The 2009 National Best Books Award tapped a new book by Steven Spear SM ’93, an MIT senior lecturer and senior fellow at the Institute for Healthcare Improvement. Chasing the Rabbit: How Market Leaders Outdistance the Competition describes how exceptional organizations create competitive advantage through the strength of their internal operations. He dissects what “high-velocity companies” like Toyota and Southwest Airlines do that droves of wannabees do not. On Spear’s Chasing the Rabbit blog you can read the first chapter of the book and get current tips. The next global broadcast of the MIT Enterprise Forum, a project of the MIT Alumni Association, targets how to thrive in turbulent times. 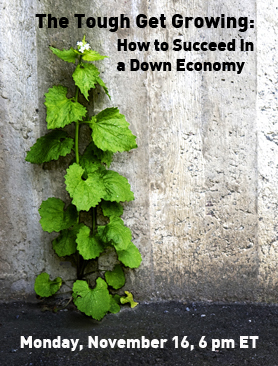 The Tough Get Growing: How to Succeed in a Down Economy is set for Monday evening, Nov. 16. You can network and see it on campus or go to one of the many worldwide viewing sites. Speakers include innovative business leader Helen Greiner ’89, SM ’90, CEO of the Droid Works, a robotics skunkworks. She is co-founder of iRobot which she transformed, with business partners Colin Angle ’89, SM ’91, and MIT Prof. Rod Brooks, from an spin-off into a ~$300 million business and the global leader of practical robots. “Starting Up When the Economy Is Down” provides business tips from fellow alumni and points to MIT resources for alumni. The day was full of the accoutrements of a Presidential visit—cameras, barricades, fresh paint, devotees, police, people on the rooftops with binoculars and guns, and somber-looking men whose darting eyes constantly scanned the crowd. It was a good-feeling type of day because President Obama knows something about motivation. He said he values us, he values our work, and he knows our work makes a difference. Speaking of MIT in particular, and saluting entrepreneurs, inventors, researchers, and engineers in general, he also said, “The nation that wins this competition will be the nation that leads the global economy.” It’s nice, and refreshing, to know that the President of the United States knows that. It all took me back to another speech, Susan Hockfield’s inaugural address, four years ago. She identified the two major interdisciplinary themes she would promote as President of MIT: engineering + biology + brain and cognitive science was one; energy and the environment was the other. Out of the energy and the environment theme emerged MIT’s Energy Initiative, aka MITEI, and that is what drew the other President to use MIT as the venue for his call-to-arms speech. Now more often that not here at MIT, I stand with the loyal opposition on matters of policy, and sometimes I get quite cranky about what I take to be a shift toward a more corporate look and feel. But when our current President is a past president, and people ask what she accomplished, if the answer is that she started the MIT Energy Initiative, which saved the planet, not to mention the economy, then I think she will have left behind a pretty good legacy. It’s the nature of big jobs. The superposition principle does not apply. You don’t sum up all the things people do, you honor the best thing or condemn the worst thing. In this case, the best thing has big potential.